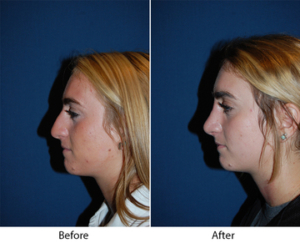 One way we generally judge Charlotte, NC rhinoplasty surgeons is to look at their gallery of before and after photos. Photos, of course, can be deceptive. Recently there was much speculation among people who devote way too much of their attention to the Kardashians that Khloë Kardashian had gotten a nose job, because the way the light hit her nose made it appear to be a slightly different shape. This is why nose job before and after photos are usually taken at the same angle and in the same light, to make sure there is no confusion. According to general rules of facial aesthetics, which apply regardless of the shape of the head, the outer part of the nostrils should be about as wide as the space between the eyes. If they are too wide, the rhinoplasty surgeon may find it necessary to fracture the nasal bones in order to narrow the nose at the top before refining the lower nostrils. While doing this, the surgeon must take care to keep the nostrils perfectly symmetrical, and to make them symmetrical if they aren’t already. Dr. Sean Freeman is the best rhinoplasty surgeon in Charlotte, NC. He’s been certified by two different surgery boards, the American Board of Otolaryngology (head and neck surgery) and the American Board of Facial Plastic and Reconstructive Surgery. He has devoted himself to facial plastic surgery, including nose jobs, since 1988, and has a gallery of nose job before and after photos. Many of his patients have already gotten nose jobs from other surgeons and come to him for revision rhinoplasty to get the results they really wanted. If you live in or near Charlotte, NC and are in search of a nose job surgeon, schedule your appointment today or ask for an online consultation so you can take advantage of the discount on the consultation fee.